Crystal habit: occurs commonly as euhedral octahedral crystals, less frequently as dodecahedrons which may show striations parallel to the intersection with the octahedron. Also as fine to coarse granular massive, and as laminated masses. Magnetism: Strongly magnetic. Specimens that act as natural magnets are known as Lodestone. Magnetite is one of the most ubiquitous minerals, occuring in a great variety of igneous, metamorphic and sedimentary rocks, typically as disseminated crystals or grains comprising less than one percent of their host rock. Most plutonic igneous rocks commonly contain magnetite as disseminated grains. In some igneous melts, magnetite grains may concentrate by magmatic segragation thereby becoming the main or only constituent, thus forming ore bodies of economic importance. Magnetite often occurs in metamorphic rocks which formed from ferruginous sediments in both regional and contact metamorphic settings, the magnetite commonly forming by the reduction of hematite and ferric hydroxide minerals. Banded Precambrian iron formations commonly contain magnetite. Magnetite also can form from volcanic gases, and from high temperature hydrothermal sulfide solutions, and has also been found in some meteorites. Magnetite and corundum can occur together forming emery, a fine-grained mineral assemblage that has been used since ancient times as an abrasive. Magnetite detrital grains are commonly the main constituent of black sands. Magnetite is characteristically recognized by its strong magnetism, color and streak. The name magnetite is thought to be derived from the ancient locality Magnesia near Macedonia. According to Pliny, the name was derived from that of a shepherd named Magnes who first discovered magnetite on mount Ida while pasturing his flock, when pieces of magnetite (Lodestone) clung to the metal nails in his shoes. Magnetite has been used for thousands of years as amulets and talismans. It was said to give protection from enchantments and evil spirits, and to provide invulnerability to soldiers. It was also said to attract power, favor and love, and to guard against unfaithfulness. 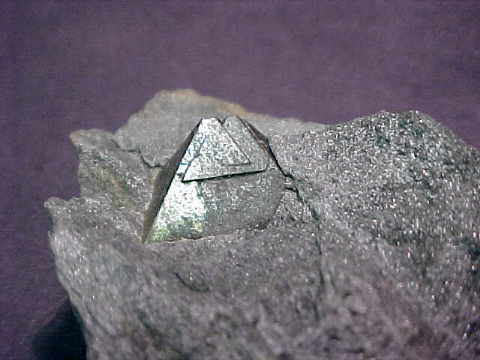 Magnetite is an important ore mineral of iron. A mixture of magnetite and corundum together is known as emery, a fine-grained mineral assemblage that has been used since ancient times as an abrasive. The astrological signs of magnetite are Aries, Capricorn, Aquarius and Virgo. Magnetite is said to enhance one's spirituality and to assist in meditation. It is also said to increase physical energy, vitality and endurance, and to dispell negative emotions such as fear and anger, and to attract love and protect virtue. Magnetite is said to help strengthen the circulatory system and to help in the treatment of blood and bleeding disorders. This is the end of our Magnetite Factsheet and Information page.